The first thing that comes to your mind after hearing the words bean bag chairs is probably comfort, right? 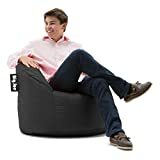 Reputed for providing the comfiest, relaxing sitting experience, bean bag chairs are coming back into fashion after a long time. 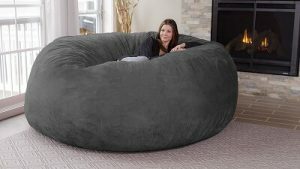 Not just for dorm rooms or bachelor pads anymore, bean bag chairs are now part of the home decor and style statement. Since you are here for the best bean bag review, we are not going to disappoint. Read on to know about the top bean bag chairs today’s, and how you can pick the best one for you. What Are The Benefits Of Using A Bean Bag Chair? Did you know that bean bag chairs were invented only around 50 years ago? In 1969, a team of Italian designers was experimenting with chair designs to cater to the mood and fashion of the 60’s generation. The first designs of these chairs were pear-shaped, and thermocol pellet fillings. Bean bag chairs have come a long way from there, with a variety of designs and shapes being available today. Usually designed for kids, these durable bean bag chairs for kids measure around 120 inches on the circumference. These are the smallest size you will find in the market. Large ones measure up to 140 inches and are designed for adults with a little wiggle room. If you are really tall like over 6 feet then the extra large bean bag chairs are for you. These measure around 150 inches on the circumference. These are the bean bag chairs you usually see in people’s rooms – large enough to sit comfortably and move your arms and legs around. 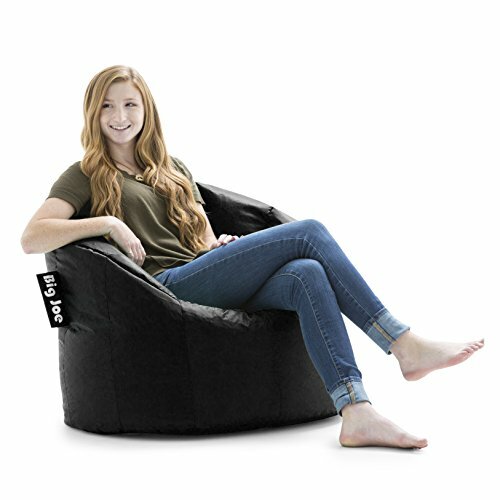 The mother of all bean bag chairs, the double large chairs have no maximum limit for size, and often look quite different from your usual ideas of a standard chair. 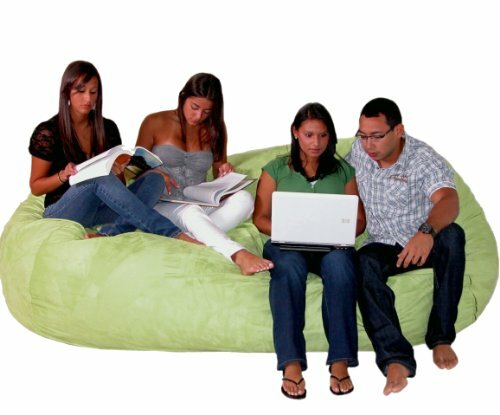 The most common bean bags are round in shape and are suitable for activities ranging from relaxing after a hard day’s work to watching movies and using computers. Often confused with ottomans, square bean bags chairs were traditionally used as footrests. However, nowadays these chairs have been gaining popularity and replacing wooden chairs and sofas. Designed for computer gaming enthusiasts, these chairs offer more ergonomic support than most other bean bag chairs. 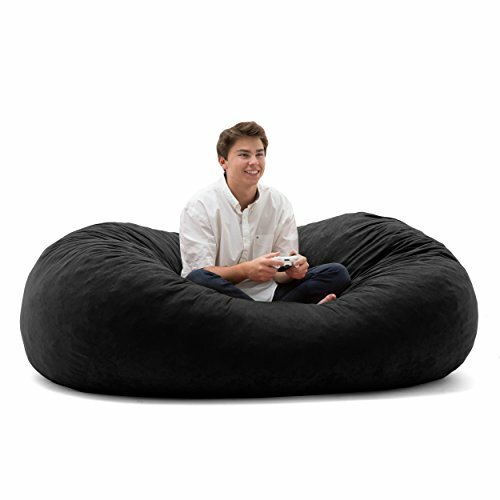 A bean bag chair for gaming has great back support and the usual comfort of bean bag chairs. These come in all sizes, shapes, and colors, and are aimed at both kids and adults. These durable bean bag chairs for kids can be shaped like animals, can have a variety of colors, and be insanely versatile in size. 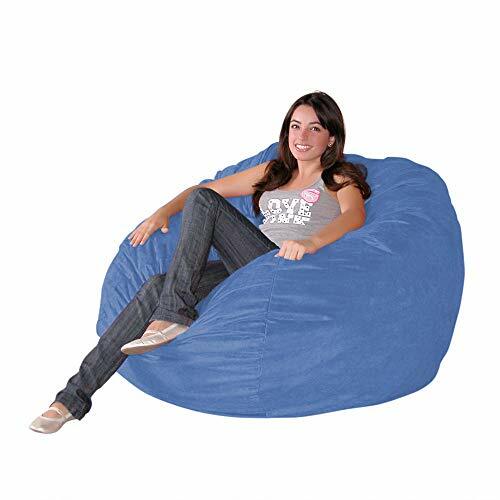 For the classic round bean bag chair, our top pick is the Cozy Sack 3-Feet Bean Bag Chair. It is medium in size, very comfortable, and comes with microfiber covers that can be taken off and washed with ease. There are safety zippers for children, and the chair will change in shape to accommodate you. The whole thing takes 3-feet by 4-feet space, making it perfect for you if you have limited storage. Big Joe makes our top pick for square bean bag chair with its Dorm Chair model. The reputed manufacturer’s patented SmartMax Fabric will save you from stains and water splash. The bean bags inside are encased in double zippered covers and are easily changeable. There are pockets on the sides to keep anything you fancy – from water bottles and books to mobile phones. The Big Joe Dorm Chair also has handles on tops to better portability, making it a top-notch bean bag chair for everyday use. The one word most people use to describe the Cozy Sack 8-Feet Bean Bag Chair is – HUGE! This oversized chair from Cozy Sack can double as a chair, couch, or even a makeshift bed. You can accommodate three to four people in it easily, and the covers are very easy to clean. As far a novelty bean bag chairs go, it is hard to beat this 8-Feet Bean Bag Chair. Unlike a lot of other products, bean bag chairs come with a pretty standard design and a common purpose – to help you sit comfortably. Nonetheless, there are some factors that indeed make some bean bag chairs more suitable for you than others. In this section, we will look into some of those factors. One thing that differentiates bean bag chairs from regular chairs is that unlike regular chairs, bean bag ones do not just act as pieces of furniture in a room. They actively contribute to the overall style and look of a room. For this reason, make sure that the chair you are looking fits your decor, the color is not too loud, and blends with the other furniture with ease. Keep your budget in mind before committing to any particular brand or design. 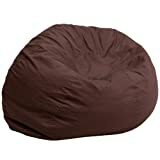 The price of bean bag chairs can range between $10 for regular ones to several hundred dollars for a bean bag for gaming based on the material, brand, and design. Make a mental note of your budget before sifting through models and shop accordingly. Before buying a particular beanbag chair, make sure that all the materials used – both inside and out, suit your taste. Some people, for example, can be allergic to furs. Any bean bag chair using an exterior based on fur would be a disaster for them! We recommend expanded polystyrene for the materials on the inside. This is because it is both comfortable and easily replaceable after wear and tear from prolonged use. For the materials on the outside, leather is always a good choice, but if that is out of your budget, you can go for faux leather as well. Looking into the design of any particular bean bag chair can seem trivial. What’s there to see? It’s a chair designed to sink in when sitting, right? Though that may be the general case, some people like a bean bag chair that sinks just a little, while some prefer chairs that almost wrap themselves around the person sitting. Buy a product that suits your own particular taste, rather than going for the trend. For people with medical conditions like a sore neck or a bad back, choosing a bean bag chair may be a bit tricky. The simple solution is to look for bean bag chairs on a little firmer side – that is to go for a product that provides the comforts of a bean bag chair but comes with a little bit of added firmness to help with the medical conditions. There is bean bag chair with back support as well for you to choose from. Without any doubt, bean bag chairs offer more comfort than regular chairs. 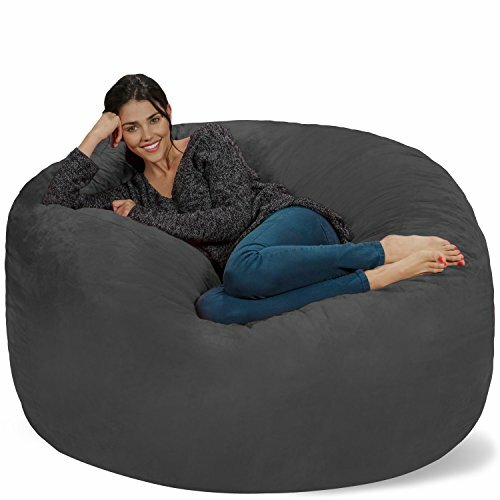 Imagine coming home after a long day and just sinking into the soft, warm comfort of a bean bag chair. Numerous trees get chopped down every year to provide for wooden chairs. Bean bag chairs, on the other hand, use mostly synthetic materials, like the expanded polystyrene as mentioned above. By using these chairs, you too can contribute to saving the environment. Bean bag chairs can contribute greatly to the decor of any room. With a bit of a wasteful purchase, you can turn a bean bag chair into a style statement for your room. Contrary to the popular myth, bean bag chair can come with medical benefits too. It can help with a backache, headache, and the general stress that gets accumulated from sitting for too long. Not all bean bag chairs are ergonomically beneficial though – you have to keep an eye open while buying your product to get the perfect bean bag chair. A great square-sized chair that can be fit in a limited space, the Dorm Chair from Big Joe is both a comfortable and a handy affair. There are pockets on sides to keep your drink, smartphone, or books, and the cover is easy to clean. Also, the chair is made from materials that are 100% recyclable, making it as environmentally friendly as it is comfortable. Big Joe is a trusted name when it comes to best bean bag. Its Fuf (pronounced as Foof) line is a patented product that is big, comfy, cushiony chair, and you’ll definitely love how it lets you lounge around comfortably. The chair is filled with a mix of shredded foams and memory foams and measures around a huge 6 feet. Two to three persons can fit easily on this chair for watching movies, or just lounging around. 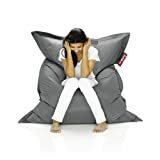 A modern take on the traditional bean bag chairs, the Cozy Sack 3-Feet Bean Bag Chair is a 3-feet soft, comfortable chair filled with urethane foam. Unlike most other bean bag chairs where you need to fluff those after every use, urethane foam shifts back to its original shape after sitting up. This would mean less hassle and comfort for you! This five feet of cushiony comfort comes in a size suitable for both adults and children. Apart from being durable bean bag chairs for kids, these can helps adults relax after a hard day’s work too.Or you can just lounge around with a book in hand – the possibilities are endless. 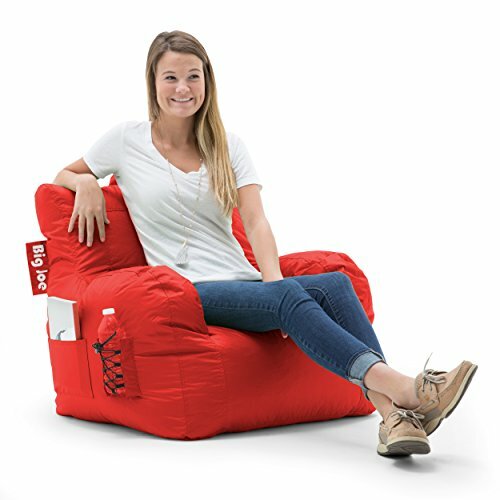 The Chill Sack Bean Bag Chair is filled with shredded, soft memory foams that make for a great sitting experience. The covers are double-stitched and very easy to clean. Another great product from Big Joe, the Lumin Chair is a great bean bag chair with very durable, easy to clean, double-stitched covers. The chair is filled with Big Joe’s patented UltimaX beans, which can be refilled with ease and bought separately. Fatboy the Original is not only a cool chair, but a stylish fashion statement too. Designed by Finnish artist Jukka Setala, it can brighten up any room in your house with its vibrant color and versatility. Its polystyrene bead filling resides in covers that are water and water-resistant and can be cleaned by using a simple cloth wipe. Whether it’s your home or office, Fatboy the Original can be a fun piece of furniture to have. Now better than ever with pre-assembled foams, you can get this four feet of plush, comfortable bean bag chair by simply zipping up the cover. 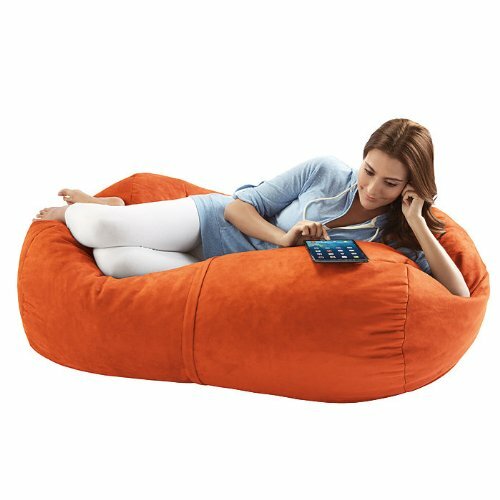 The Jaxx Sofa Saxx Bean Bag Lounger is a great lounging option for both adults and kids with its professional grade foam fillings and durable, yet very soft covers. Its childproof zipper on the inside helps keep the foams from spilling out to give you the relaxing you deserve. The Milano Chair is a very lightweight yet comfy product from Big Joe that takes the next place in our best bean bag chair review. Weighing at just 5 pounds, it is very portable and can accommodate one adult comfortably. There are handles built-in to move it around, while the beans inside are refillable with ease. Don’t be misled by the name – Flash Furniture Oversized Solid Brown Bean Bag Chair is not exactly oversized, rather made to fit one adult comfortably for relaxing and lazy lounging. At just over two feet in circumference, this chair can make a solid addition to your home or office without taking a lot of space. Like most other best bean bag on this list, this Oversized Solid Brown Bean Bag Chair comes with a spill cover. The beans inside are secured with a metal zipper and are designed to give you the comfort you deserve after a day’s hard work. Our favorite extra large piece in this best bean bag review – the Cozy Sack 8-Feet Bean Bag Chair – is a humongous, cozy chair for you to simply sink in and chill. To be honest, it can be a bit overwhelming as a piece of furniture, but what else do you expect from a chair that is eight feet long and nearly four feet wide? The materials inside complement the chair tremendously as urethane foam makes for the softest sitting experience. You don’t need to fluff the foam either – it will revert back to their original size after you get up. The chair can accommodate three to four adults comfortably, and can be used as a makeshift bed for guests, or even for you! As for our recommendation for top bean bags, our pick in the small and medium bean bag segment is the Big Joe Dorm Chair. It is suitable for both adults and children, very lightweight at around 6 pounds. It also comes with handles to move it around easily and has pockets around the sides to keep things like phones, books, or drinks. Among large bean bag chairs, Fatboy the Original is hard to beat with a very chic, sleek design. It can be a great addition to both your home and office and can be assembled into pretty much any shape you want. And finally, we are in love with the huge Cozy Sack 8-Feet Bean Bag Chair both for its comfort and versatile usability. As far as extra large bean chairs go, this is as comfy as it gets. It needs no fluffing either – you can just lounge around and relax. Nothing says welcome home after a day’s hard work better than a simply lounging around in a soft, comfy bean bag chair. To buy the best bean bag chairs, take a look at your room, decide on what size and model would fit you best and pick one from our list. Keep your budget in mind, and make sure the materials used are of good quality. You can also consider other factors like ease of cleaning, whether the chair requires regular fluffing and availability of materials for refilling the bean bags. We assure you, a good bean bag chair will give you comfort like never before because you deserve it!